Wil Trump remember how Democrats voted during his re-election campaign? Republicans introduced a bill in the Senate to require that doctors must provide medical care to babies BORN ALIVE during an abortion. There were 50 Republicans present for the vote. All 50 supported the bill. But 44 out 47 Democrats present voted for infanticide, including 6 who are running for President in 2020. But first, in a few hours the Senate will vote on advancing a straight-forward piece of legislation to protect newborn babies. This legislation is simple. It would simply require that medical professionals give the standard care and treatment to newborn babies who have survived an attempted abortion as any other newborn baby would receive in any other circumstances. It isnt about new restrictions on abortion. It isn’t about changing options available to women. It’s just about recognizing that a newborn baby is a newborn baby, period. This Bill would make clear that in the United States of American, in the year 2019, the medical professionals on-hand when a baby is born alive need to maintain their basic ethical and professional responsibilities to that newborn. It would make sure our laws reflect the fact that the human rights of newborn boys and girls are innate. They don’t come and go based on whatever the circumstances. If that medical professional comes face-to-face with a baby who’s been born alive, they are looking at a human being with human rights, period. So how did it go? Well, all the Republicans in the Senate voted for it. And none of them voted against it. The bill failed, though. It failed because 44 Democrat senators voted against it, and it needs 60 votes to pass. What I think is interesting from a strategic point of view is that 6 of the 44 senators who voted against it are running for President. 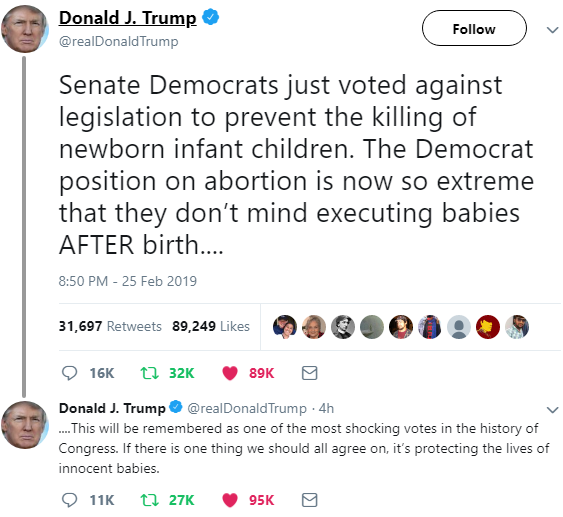 If one of those candidates ends up being the Democrat nominee, Trump will be able to use their vote on this infanticide bill in debates and in election ads. 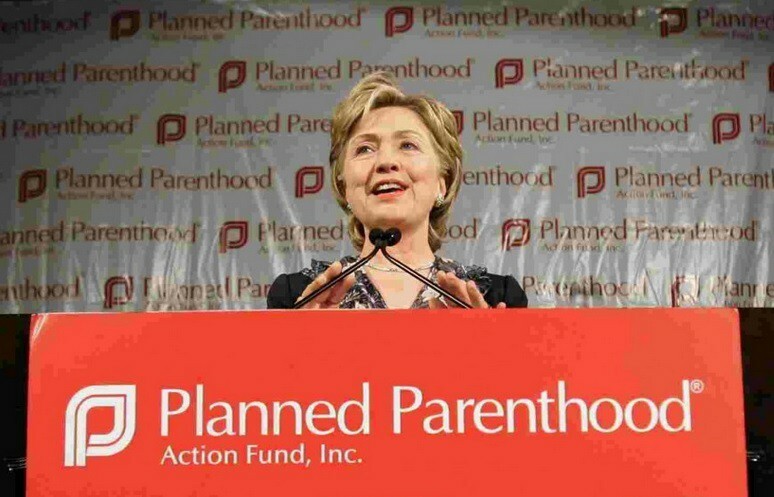 And it’s not just these Democrat Presidential candidates – infanticide is now the mainstream view of most Democrat politicians. 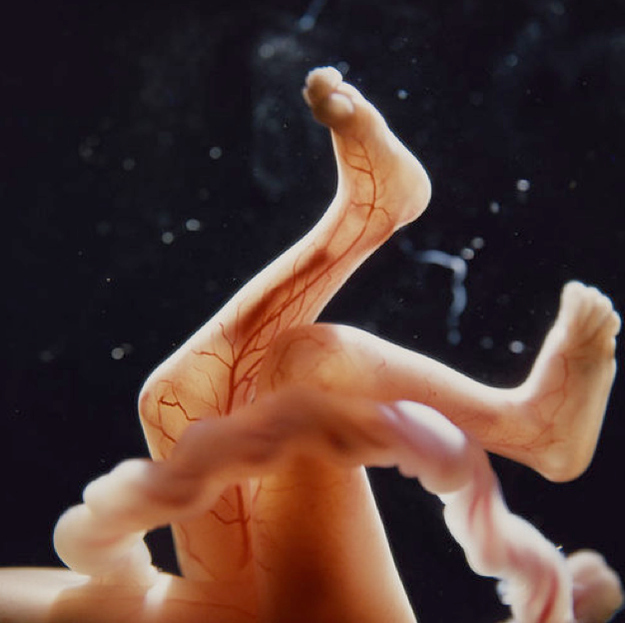 New York, Vermont, New Mexico and now Rhode Island politicians are pushing radical pro-abortion legislation that could legalize the killing of unborn babies for basically any reason up to birth in their states. 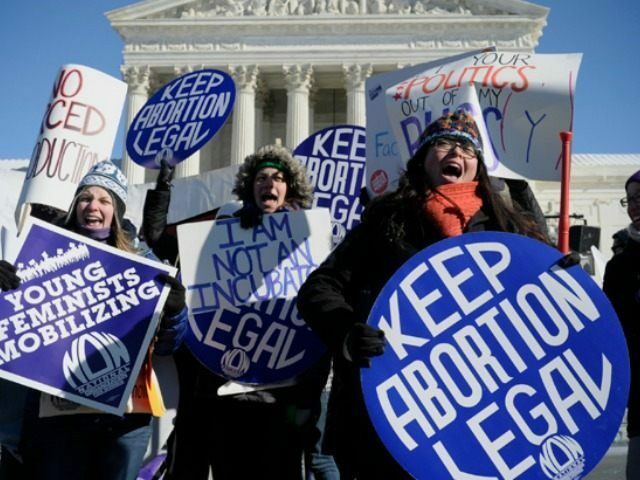 Earlier this week, Rhode Island lawmakers introduced legislation to keep abortion legal and unrestricted if the U.S. Supreme Court overturns Roe v. Wade, the AP reports. It was just New York, Virginia, Rhode Island, New Mexico and Vermont at the end of January. Will Democrat voters get on board with infanticide? I think some of their liberal special interest groups will. But think about how independents supported Trump’s opposition to infanticide in his State of the Union speech. I think that the Democrats are being forced to move their party too far to the left to win another election. All it takes is for pro-lifers to introduce legislation, have them vote on it, and then make the appropriate election ads. No one can win a presidential by appealing only to their base. It comes down to who wins the independents. Trump is now the moderate candidate on social issues. The Democrats are pro-abortion extremists. They won’t win a majority of independents in a general election. They’ve just slid too far to the left. What does it really mean to be “pro-choice” on abortion? A lot of conservatives complain that Republicans don’t pass enough pro-life legislation when they hold the House, Senate and White House. The truth is, the House Republicans DID pass some pro-life legislation from 2016-2018. Some of it got signed into law, but most of it died in the Senate, because of the Democrats. It’s not unreasonable to request expedited processing for a bill that ought to pass unanimously. After all, who would vote against a born baby? So, you make a bill outlawing infanticide, and 40 Republican senators co-sponsor it. But the bill dies anyway, because Democrats won’t support it. The abortion debate was never about weeks or months or viability. Talking about when an unborn baby becomes a human being was just a rhetorical smokescreen to dehumanize unborn children, the same way that skin color was used to dehumanize slaves. Democrats always knew that unborn babies were human beings at every moment during pregnancy. They’re strong. The baby is weak. The baby is in their way. 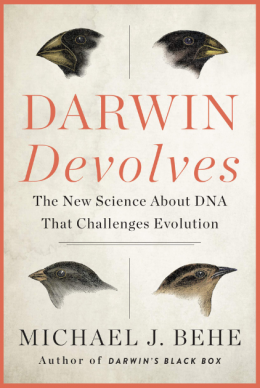 Who cares about reason and evidence? Who cares about right and wrong? If something gets in your way, just kill it, and then silence anyone who makes you feel bad about your selfishness. I would be very careful about electing people who are willing to kill innocent children who get in the way of their pleasure-seeking. If they aren’t willing to control their hedonism to protect innocent children, they certainly aren’t going to put the brakes on for you. Last week the Governor of New York signed a law that makes abortion legal right up to birth. But other Democrat governors are willing to do the same thing in their states. We’re really seeing Democrats reveal their real priorities now. It’s not job creation, it’s infanticide. When asked about the controversial late term abortion bill presented in Virginia’s House of Delegates this week, Governor Ralph Northam said a fully developed child born in the third trimester would be kept alive, but the physician and mother would get to discuss and decide whether to take its life or not. Just to be clear, if people are deciding whether the baby should live or die after it’s been born, that’s infanticide. Babies are viable at 22 weeks, so there will be abortions being performed on viable babies, from 22-36 weeks, and even after birth. […]The Rhode Island Reproductive Health Care Act, co-sponsored by state Sen. Gayle L. Goldin and Rep. Edith H. Ajello, would strip away even minor, common-sense abortion regulations – ones that a strong majority of Americans support. It would eliminate all protections for unborn babies and codify Roe v. Wade into state law in case the U.S. Supreme Court overturns the ruling. […]Earlier this month, [Rhode Island Gov. Gina] Raimondo promised to support the pro-abortion bill in her State of the State address, NBC 10 reports. So it’s New York, Virginia, Rhode Island, New Mexico and Vermont. 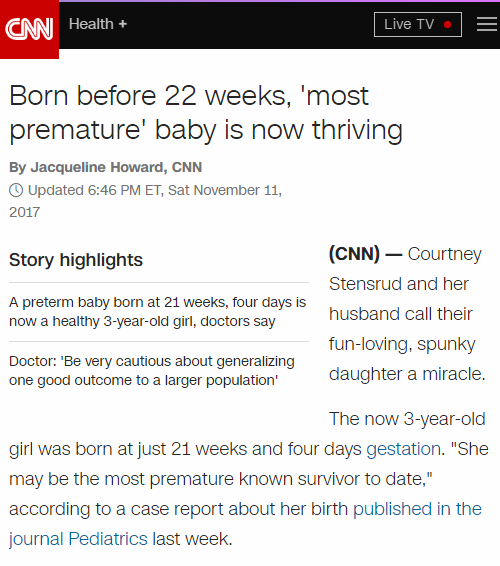 The only silver lining to this cloud that I can think of is that Democrat voters who don’t pay attention to the news will hear about this and reconsider whether they want to be on the side of people who don’t think that a baby is a baby, even when it’s just about to be born, or has just been born.